There’s a statement I hear all the time that makes me cringe a little each time I hear it. Aaah! Nails on a chalkboard. Dogs should be tail-wagging, enthusiastic, meal-finishing eaters, but we have made them into the opposite. Poor appetite is often indicative of an unhealthy dog. Not in every case, but in a lot of them. And it’s not necessarily a physical malady that is causing the problem. Most of the time the cause is psychological. If your dog at home is at her ideal weight and a great eater, excellent! Keep up the good work. If you have a picky eater at home, this article is for you. I want to share some probable causes along with refreshingly simple and effective ways to restore your dog’s appetite. People love to be caretakers. As pet owners, we are responsible for the daily care and overall health of the animals we take in. It is our duty to make sure they are better off with us than they would be on their own. Animal husbandry is a beautiful thing. It’s just that some of us unintentionally take it too far. Another thing pet owners love to love are supplements and feed additives. I’m guilty of this one myself. It makes us feel good to give our dogs some extra goodies so they don’t get bored eating plain ol’ boring dog food. They are our best friends, after all, and they deserve it. Right? Here’s the thing. Commercial feeds with an AAFCO statement are complete feeds, which means they are nutritionally balanced. The average dog shouldn’t need anything extra in her diet. Over-supplementation can be particularly troublesome when it comes to fat soluble vitamins (A, D, E, and K) and some minerals, such as selenium. Feed additives often add palatability, which is great for getting picky dogs to eat. But once they get used to the extra tasty stuff, going back to the plain ol’ boring stuff becomes even harder to do. Convincing your dog to eat by adding tastier toppings is not healthy or effective in the long run. My own dogs have all been ravenous eaters, but they didn’t all come that way. I encourage my dogs to get excited about food. I think it’s a fantastic training reward and a great motivator. Several of my dogs over the years have started off as picky eaters, but none have stayed that way. If you want to find out how I fixed it, read on! Now, before taking any of my advice, take your picky eater to your vet and verify that there’s nothing awry with her health. No healthy dog will starve herself. Most appetite issues have simple behavioral fixes, but it’s very important that we rule out anything serious first. This is especially true if the decrease in appetite is sudden. Consistently picky eaters can be fixed, but a dog won’t lose her appetite overnight unless something is wrong. 1. Is your feeding schedule irregular? 2. Do you feed treats in between meals? 3. Does your dog live a sedentary lifestyle? 4. Do you panic and worry every time your dog refuses food? 5. Is your dog new to the household? 6. Have you recently had a big change in your household? 7. Is your dog overweight? 9. Is your dog an only dog? If you answered yes to at least one of the questions above, that is probably your best starting point for correcting course. Let’s explore the points above in a little more depth. Dogs crave routine, just like people do. Personally, I prefer feeding once a day, but my dogs eat so much and are so active that I don’t feel comfortable with them eating all of it in one sitting. So I split it up and feed them twice a day. Another perk: when dogs are fed on a regular schedule, they also eliminate on a regular schedule. Pick whatever feeding schedule works best for you and stick to it. Ever heard of a mother who worked tirelessly for hours preparing a meal, and then let her kids eat a pint of ice cream just before dinner? Didn’t think so! I can’t tell you how many times my mom told me to stop snacking right before dinner when I was growing up. She didn’t want me to spoil my appetite, and she would rather I fill up on a healthy dinner rather than junk food snacks. It’s no different with dogs. If they know they’re going to get delicious tasty treats or dog food, they’ll pick the tasty treats over the boring stuff every time. So feed less treats between meals. If treats are a necessary part of your training regimen, either look into low calorie treats, use dog food as a reward in lieu of treats, or feed smaller meals (so you can afford to continue rewarding with treats). Exercise breeds hunger. This is true for humans as well as dogs. The more energy you burn off during the day, the hungrier you will get. The opposite is also true: if your dog is mostly sedentary, she’ll have no reason to have a healthy appetite. Give her more exercise during the day and her appetite should increase. Dogs pick up on this energy. The detrimental effect it has on your dog’s mentality cannot be understated. Your worry and concern will cause your dog to worry and be concerned. Worried and concerned dogs don’t become healthy eaters. It’s also very common for concerned owners to dote over their dogs more than they normally would. Dogs love this attention, and quickly make the connection between not eating and more attention. Worry and panic will only exacerbate this problem. Dogs need an adjustment period, just like we do. Moving into a new environment can be a huge shock to a dog’s system. Some dogs just need space and a little quiet time alone. Other dogs need interaction and playtime. Every dog is different, so be sure to read your dog and come up with a plan to help her adjust. Time is often the best medicine in this case. Take a step back, get to know each other, and reevaluate in a few weeks. Things like marriage, divorce, new pet, new job, new kid, kid moving away, moving to a new house, etc. can be a difficult challenge for many dogs. These don’t even have to be big changes. Sometimes small changes can throw dogs off their routines. Usually the dog’s behavior will change. Some will get snarky. Others will become lethargic. Many will start having accidents in the house. Some will stop eating. As in the former example, often the only thing that will ease this transition is the passing of time. Make sure you spend some quality time with your dog and make sure she is happy and has some excitement in her life. Think about the things she enjoys most, like going on walks or snuggling or playing with you outdoors, and do as many of those with her as you can. “A friend recently asked me to advise him because his dog had become seriously overweight. I watched him feed her dinner, and I had to bite my tongue as he poured cream and gravy and hid treats in the food, said a big ‘I love you!’, and gave her the bowl. I asked about all the added yummies and extra affection, and he explained that if he did not do this, she would only eat a bite or two and leave her food. 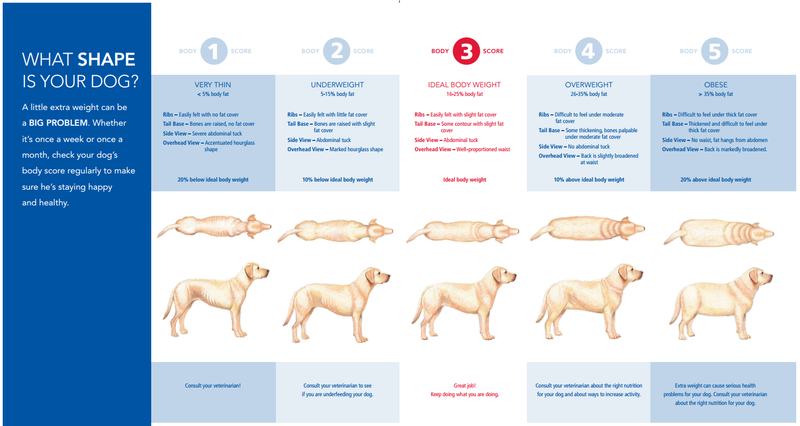 If you aren’t sure if your dog is overweight, it’s likely that she is. Find out using this chart and verify with your vet. The first: feed less. If your dog is overweight and being picky, listen to her! That is a healthy reaction to an unhealthy situation. In almost all cases, this is as simple as reducing the amount of food you put in the bowl. Check with your vet about the best healthy eating plan to follow. The second part of the solution is exercise. Sorry to make you slump in your chair, but it’s good for both of you! A healthy, safe place to start is walking. All it takes is small, incremental steps to drive big results. Again, if you aren’t sure how to start, make a phone call to your vet and discuss the best plan of action. Free feeding is a poor practice all around. Although convenient for the caretaker, it does not set the dog up for success. This is true in single-dog households and especially true in multi-dog households. As a pet owner, it’s your responsibility to keep your dog at a healthy weight, which means to control how much and what type of food your dog eats. You can’t do this while free feeding in a multi-dog household. Some dogs will get more than they should when others will get less. Not good. If food is always available in a single-dog household, the dog knows she can eat whenever she wants. No one will eat it if she walks away, and it will be there whenever she decides to come back to it. This practice rewards dogs for having a low appetite and turns them into picky eaters. Dogs are not designed to be grazers. Food needs to be perceived as scarce and valuable. The solution to this one is simple: stop free feeding. Feed once or twice a day. Pull the bowl when your dog walks away from it, and don’t give it back until the next meal. It won’t take your dog long to catch on. If you put the bowl down once a day and don’t pull it when your dog walks away, you are free feeding. This one ties into the example above, and is usually fixed in the same manner. Sometimes dogs who live in a house with no other dogs decide that finishing a meal is not that important because there’s no one around who will eat it. Dogs will often “compete eat” as soon as it appears their food is in imminent danger of disappearing. When they’re afraid their food is going to get stolen, they become more inclined to eat what is provided for them. Now, as much as I’d love for it to happen, not everyone can just go out an adopt another dog. However you can replicate the effect of “compete eating” at home using the same tactic discussed above: pull the bowl when your dog walks away from it, and don’t put it down until it’s time for her next meal. If she still doesn’t eat, rinse and repeat until she does. Remember that dogs are not grazers. No healthy dog will starve herself. It usually only takes 2-3 days of pulling the bowl for the dog to understand that they need to eat when food is provided. In short, when a dog’s needs are being met, they will have a healthy appetite. We, as a society, often look at the things we have amassed and see them as fulfilling. This is often amplified when it comes to our dogs. Top shelf dog food, fluffy beds, an outerwear collection, and toys galore. Dogs are here to remind us to come back from the rat race. Life is about more than the things we own. Dogs don’t care about “things.” They crave a life that engages their sense of adventure. They need an outlet for their curiosity. They need exercise, boundaries, and adventure over a bunch of fancy collars. And this is how I want to live my life, too. The tips I’ve mentioned will set 95% of picky eaters straight if you follow protocol. For the 5% that don’t change, It might be worth a trip to the vet. You may be dealing with a pain issue. Dogs are often very stoic about masking pain, and loss of appetite is often the first sign. Do you have anything to add? Do you have a picky eater? What methods have you tried to reverse it? Were you successful? Please share in the comments! I read and appreciate each one. And as always, if the article was a benefit you in some way, please share with your friends!